Sister Theresa might be the collection’s most intriguing personage. Minicucci thankfully avoids the stock clerical representations that mar many recollections of youthful Catholicism. Sister Theresa’s sting does reside within her desire for control, yet her actions occur within the nearly docetic Catholicism of the text, as Minicucci clearly peels ritual from belief. The mode of Catholicism has always been prefigured toward postmodernism: the Word and words are acts of transubstantiation. Like the relic-holding room of the collection’s title, and perhaps Updike’s Protestant perception of Catholic iconography, faith paradoxically needs palpable signs to survive, even if those signs are the preserved fingers of saints. 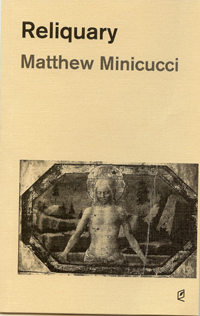 Minicucci’s book, by focusing on the core sequence of the Passion that lines church walls, considers what happens when a religious ritual suffused with layers of signs becomes wholly that which is signified. The act of poetry then becomes an act of “new” faith. but don’t dare uncoil our fingers. The narrator is torn: while much of this sequence is “only symbol,” a “small thing which has been wrenched apart / [that] we seek to put back together”, why does he fall back into nostalgic faith? The answer might appear later in “Figure 7: Jesus Falls (2),” where the narrator concludes that he does not believe in the “pretend” act of transubstantiation because the “wine-dark liquid has no hand / on the treacle and spit that filled my mouth after a fight / how it tasted like the snipped tin / Chris dared me to eat off the floor of my grandfather’s shop.” The narrator tastes the Host and the spit, but the latter has no referent other than direct experience. Yet that desire for palpable discovery ironically leads him back to the Passion sequence, the most violent and visceral New Testament narrative. Like the other children, he “can’t help but stand sedentary, watching / the light move along the cross / as it lies on Jesus’ back like a blanket.” He again reaches for the icon, and runs his “index finger along his sinewy arm.” He must touch faith. that slips through a collar or a rolled cuff. He mouths the letters INRI “again and again, trying / to find some secret word; an incantation in that breath; / simple song that waits and swells the tongue.” Whether that song and faith requires a divine antecedent is not the point: the search is delivered, given flesh, and made real through words. Nick Ripatrazone‘s books include Oblations, This Is Not About Birds, The Fine Delight: Postconciliar Catholic Literature, and This Darksome Burn.